Have you always dreamed of a kitchen island? Or are you renovating your kitchen and want to include an island in the new design? Are you looking for a new look for your kitchen or just to add some new functionality to your kitchen or are you completely renovating your kitchen and are considering adding a kitchen island? Well, keep reading...your dreams can come true! With the wide range of portable kitchen islands available on the market today, you are sure to find one that meets your function and design and decor needs. 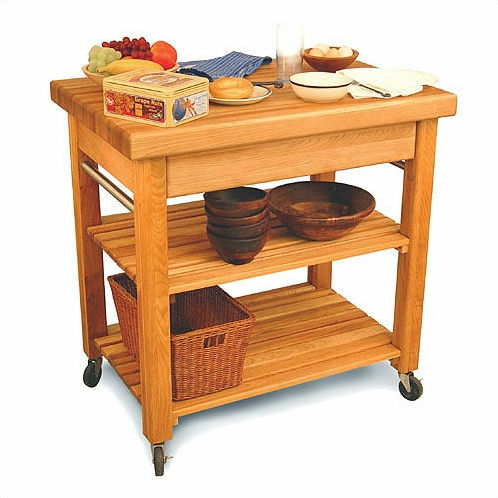 Portable kitchen islands today are available in all sizes and finishes. From solid wood to painted red - from granite or stainless steel tops to solid butcher block tops, you will find what you are looking for. There are a few things you need to know and ask yourself before you buy. What size do you need - that is, which size will fit, what are your needs, and what finishes and styles - both cabinet and top - match your decor ideas. Sizing is extremely important and should be the number 1 factor in choosing a kitchen island. 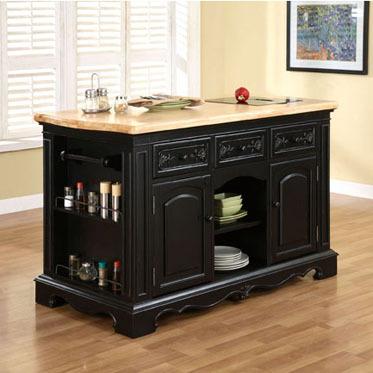 It should override the 'look' of the portable kitchen island you choose. Put simply, it must fit into your space. If not, you will end up with a kitchen that does not work. That is a not a good thing. A kitchen island should have a minimum of 3 feet (36 inches) or 1 metre of space all around it. This is a standard in home interior design, and for good reason. If you end up with less than 3 feet, you will find yourself very uncomfortable in your kitchen space. As well, if you are near any appliances, they may not open properly. Be sure that you have measured carefully before you get too excited about a particular kitchen island and then realize that it won't fit. If you have the luxury of renovating your kitchen and would like to add a kitchen island to your new design, use the same 3 foot rule. You MUST have at least 3 feet around the island - and if you have the luxury of more space, even better. So, now that you have determined the maximum size of the kitchen island you can have, what is it that you want the island to do for you? Is it simply for an extra counter surface for food preparation or is it for additional seating, perhaps? You must determine what it is you want out of the kitchen island. The last thing you need to consider is the look, design and finish of the portable kitchen island you choose - the fun part! Unfortunately, for most people, they would prefer that this is the first consideration as it is generally much easier and more fun to just pick the kitchen island that they like as opposed to doing the 'grunt' work of determining what size of island will actually fit and what function do they want the island to perform. This is why Interior Decorators and Designers get paid for what they do. What is the look you are dreaming of? Is it a modern kitchen, a French country kitchen, a classic kitchen, a contemporary kitchen, a Tuscan Italian country themed kitchen? These are just a few of the possibilities. A classic butcher block island will work in just about any kitchen as long as the wood does not clash with wood cabinets, if you have them. It can be a great addition to a modern kitchen which tend to feel cold. By adding the solid wood, you are adding a touch of warmth. Of course, if you are not interested in an eccentric look, a modern kitchen will do well with a fully stainless steel kitchen island - or a painted kitchen island with a stainless steel top. The newest trend in kitchen design is to add a kitchen island which is completely different than your existing cabinets. I think the look is great. However, be careful how you choose your island. You don't want it to clash with your existing kitchen cabinets. So, careful selection of the kitchen island finish is critical. Otherwise, the attempt at an unfitted, designer look will look very un-designer-like and just look plain awkward. 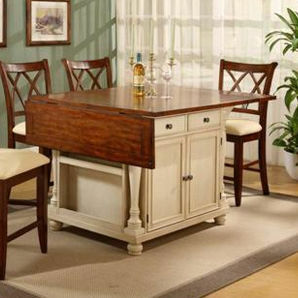 Ready to shop for your new kitchen island! Shipping available to USA and Canada! Author: Shelly Whitney, Inspired Interior Decorator and Designer. Copyright - may not be reproduced without direct written consent.